Some while ago on our old site I reviewed a game called The Art of Science, which was a science-based quiz. Although I thought the game was great, I have had a lot of troublepersuading a large enough group to play it – those who usually resort to any question but science in Trivial Pursuit (and that’s quite a lot of people) would struggle hugely. The trouble is that unless you are playing in an academic institution, the chances are there will be a proportion of people around the table who just aren’t interested in science. Now we have another game from the same people where numbers are at the heart of things, but I think (I hope) that it will be more of a general interest. That’s because it (thankfully) isn’t a mathematical general knowledge quiz, but instead a quiz where the aim is to guess closest at the size of a number (how many hairs on a typical human head, for instance), with points for getting in the right order of magnitude and for being closest, plus an optional equivalent of the old Monopoly Chance cards. Apart from the name, which like The Art of Science is a bit clumsy I think this game has great potential. I love the board which is a logarithmic spiral growing from 1 to vast numbers – it even has little hints along the way to the kind things that are on that scale. Time will tell if it will be as difficult to get people to play Guesstimaster as its predecessor… but I hope not, because it’s a great idea. It’s not cheap – £39.59 including shipping – but it is something that is different and well worth a look. 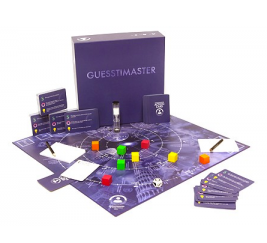 Available from the Academic Board Games web shop.